Wow…what a great day. It started EARLY to get to the airport. We sure wish every one of you could have been with us!! We had a great travel day even with getting up early. I think the excitement kept each of us going. Some had been here before and some of us, including myself, are here for the first time. Amy and Marcia, our awesome leaders, kept us on track and moving through different stages of the day in superb beehive fashion. My first impression of the country is Mountainous and very green. The flowers are beautiful and the air is humid. Today I think I heard it was 27 degrees …Celsius that is…which translates to 92 hot, sunny, humid degrees! I say WooHoo!!! Any of you who know me, know I LOVE this!! So to say that I am in Heaven is an understatement!! The team of 15 we have is so great!! 4 are not from Minnesota so that is a lot of fun too. 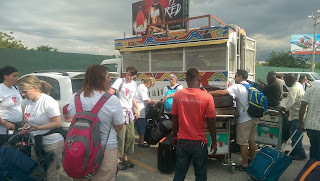 We were able to really bond when we made our way through the airport here in Port-au-Prince and piled into the “Tap-Tap”. There were 13 of us with all of our luggage, backpacks, and suitcases full of gifts many of you so generously donated, (maybe 24 big bags). We were sitting on luggage and holding onto whatever was available as our driver made his way through the not so smooth streets of Port-au-Prince. Speaking of the people here…They, too, are wonderful. Many of them like to yell and honk and have fun. I think they were probably just welcoming us to their country and saying hello in their own way!! We are now in the Guest House for Healing Haiti and going through things like the itinerary for the week and rules and what Healing Haiti the organization does. 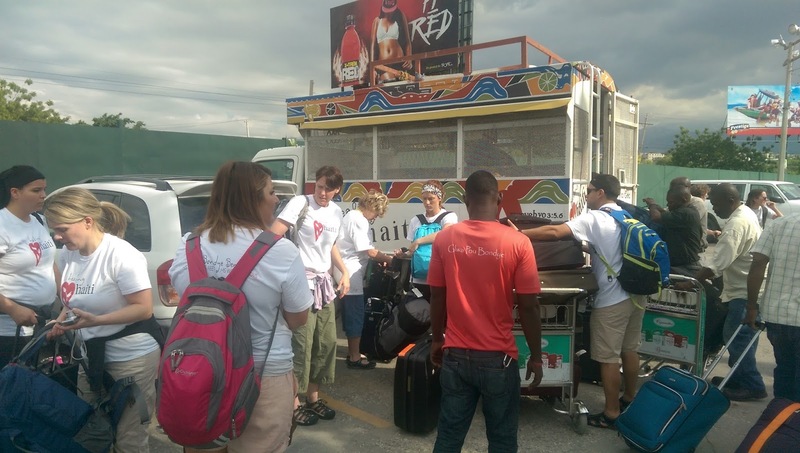 The staff are very excited and passionate about their work and loving the people of Haiti. I love the concept that they have of not done for the people what the people can do for themselves. They are about sharing the love of God in a very scriptural way by upholding families, creating jobs and Loving them with the love of the Lord Jesus. I wasn’t able to talk about the great food and great people but I’ll leave that for another day and another person so I can get to the meeting. I truly wish each and every one of you could be here with us…Hopefully this has brought you a little of the “heaven” we are experiencing. God’s richest blessings to you all!